"And When I Say I Love You..."
I have some time between gigs, so I've given myself a couple personal projects to challenge myself and have fun at the same time. One was to learn how to use my flash better... and that will be a life long project for certain. But my less demanding project is inspired by my collection of ancient postcards and memories of vintage images my grandmother used to cut out of old magazines and keep about her house. She was essentially scrap booking before the name was invented... and all the cut-outs decorated her home simply because they brought her joy. 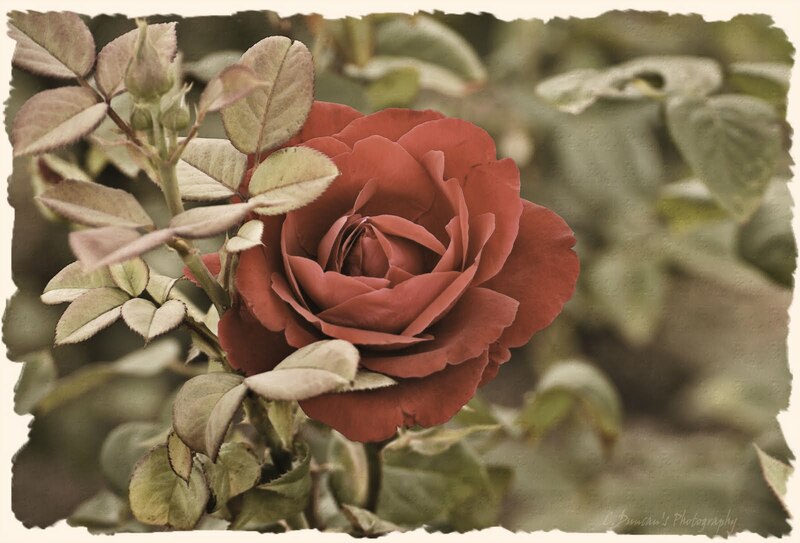 So, I've been out photographing roses (roses and vintage go hand and hand) and then adding some vintage flair in processing. I posted an example last week, and received an overwhelming response asking if I'm going to do a series or collection on canvas or cards. My intent all along, but had no idea it'd take hold so quickly. So here's peak at yet another vintage photo, initially taken with my 55-200mm telephoto. I will be revealing them all on my website soon, and the option to buy a set of twelve cards as well, very practical, and very gift worthy. I'm so enjoying the process of deciding which roses lend themselves to this aging effect, and carefully process each one without an action or preset, but hand tailored to suit each exposure. Projects that bring you enjoyment are really a gift to yourself... have you given yourself a personal project, something that has sentimental attachments? It does the heart and soul good. Thanks for the ramble ladies and gents! Enjoy the rest of your Tuesday! Plane ...And Simple ~ WideAngle Wednesday! A New Love ~Mono Monday! What's the Story? ~ Exploration Thursday! World Photography Day! ~ Floral Friday! Manufactured Patterns ~ Exploration Thursday! Doors To the City ~ Wide Angle Wednesday! Full Sun & DOF ~ Telephoto Tuesday! I Feel Gritty ~ Mono Monday! What's The Plan? ~ Floral Friday! What I Know Now ~ Mono Monday! Vintage Roses ~ Floral Friday! Simple Decisions ~ Exploration Thursday! Vintage With Meaning ~ Telephoto Tuesday!